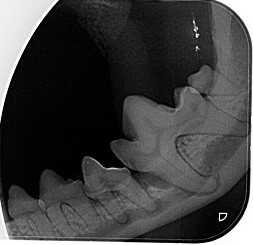 Cats can develop painful resorptive lesions ( tiny holes in their teeth necesitating removal). Studies show that about 28 percent of domestic cats develop at least one of these painful lesions during their lifetime. Oral disease begins with a build up of bacteria in your pet’s mouth. Bacteria, combined with saliva and food debris between the tooth and gum, can cause plaque formulations that accumulate on the tooth. As bacteria grow in the plaque and as calcium salts are deposited, plaque turns to tartar. Without proper preventive or therapeutic care, plaque and tartar build up leads to periodontal disease, which affects the tissues and structures supporting the teeth. Left untreated, periodontal disease can cause oral pain, dysfunction, tooth loss and systemic complications. Dental disease can lead to other health problems. Periodontal disease causes red, swollen and tender gums, receding gums, bleeding, pain and bad breath. If left untreated, periodontitis can lead to tooth loss. The inflammation and infection associated with periodontal disease may damage other organs such as the heart, liver, and kidneys, or lead to other serious health problems. What can you do to help prevent dental disease in your pet? Pets can’t brush their own teeth, but you can protect them from dental disease by combining a good dental homecare program, with regular dental examinations and a complete and balanced clinically proven dental food.As well as receiving a thorough dental examination with your pet’s yearly check-up, Wilston Vet provides complimentary dental checks with our qualified nurses to help you keep your dog or cat’s teeth clean and improve their quality of life. Just telephone us for a free appointment on 3357 3882. Brushing your pet’s teeth once a day – Although it takes dedication, this is the best way to remove the accumulation of plaque and food particles on your pet’s teeth. There are specially designed toothbrushes available to suit your dog or cat. Pet toothpastes are available in different flavours such as chicken or beef. Toothpaste designed for people is not to be used as it can upset your pet’s stomach. If you aren’t able to brush your pet’s teeth, feeding your pet a good quality diet food specially formulated to reduce the accumulation of plaque, tartar and gingivitis can be incorporated into your pet’s daily routine. Diets such as Hill’s Prescription™ Diet t/d™ is clinically proven to reduce gingivitis, stains, plaque and tartar accumulation. The large kibble size ensures that your pet’s teeth chew through each kibble, getting cleaned from the tip to the gumline every mouthful. Feeding your dog a raw meaty bone such as a brisket bone or lamb shank 2-3 times a week, or chicken necks/wings for smaller dogs. Feeding your cats strips of raw meat or raw chicken wings or necks to chew on. Greenies are also a great dental treat for your pets. 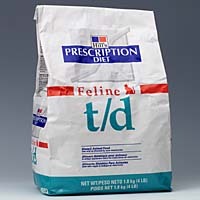 If fed daily they have been proven to reduce your pets tartar by 70%. Check for signs of dental disease in your pet with monthly checks at home.Annual dental check ups with your veterinarian which can be incorporated into their annual vaccination visit. 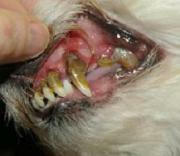 Anaesthesia is required to properly clean and polish your pet’s teeth. Anaesthesia is very safe and all animals are examined and assessed first. All patients have a tube placed in their throat that administers medical oxygen and anaesthetic gases throughout the procedure. Older and high-risk patients are given blood and urine tests and the use of alternative drugs to ensure their safety. Please talk to one of our vets for more details. 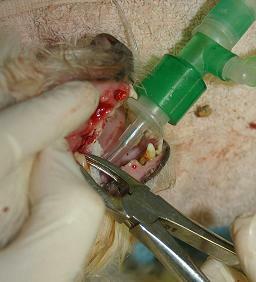 Photo above – Pet undergoing a dental scale and polish under anaesthesia. After mechanical scaling is complete, hand scalers are used to complete the removal of plaque and tartar from below the gum line. After scaling, the tooth can still have a rough surface that allows the re-attachment of plaque. At Wilston Vet we have a variable speed dental polishing unit and use polishing paste that can restore a smooth healthy surface to the teeth, both above and below the gum line. Extractions are often required where the tooth cannot be saved. 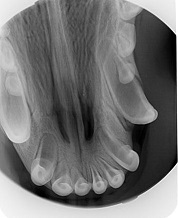 Firstly the teeth are x-rayed with our digital dental x-ray unit to confirm that the tooth requires extraction.The tooth may be broken, the roots may be rotten, the enamel may be too badly eroded, or the gums, bones and other supporting structures may be too far gone to continue to support the tooth. We are equipped with professional equipment including high-speed dental cutting burrs, elevators, forceps and root picks for this. Often it is only possible to decide if a tooth can be saved, after the tartar has been removed and x-rays have been taken. Occasionally, whether to extract a tooth or try to save it may even be influenced by the owner’s ability or willingness to keep the teeth and gums clean at home. Where brushing at home is not possible, it may be better to extract a tooth to ensure the health of the rest of the mouth. Antibiotics will often be prescribed, to kill the plaque bacteria immediately before, during and after the clean. Anti-inflammatories and pain-relievers are also given where necessary. Complimentary recheck appointments are scheduled 4-7 days after your pet’s procedure. For more information please read our E Book on dentistry by clicking here.